Home > Symptoms > What are the Minor Symptoms of Gluten Intolerance? Gluten intolerances can come in all types of severity. No two people suffer the same. The only similarity is the fact it is gluten - found in wheat, rye and barley - that is causing the reactions. The reactions themselves differ dramatically from extreme cases to very minor, hardly noticeable reactions. Some sufferers experience extremely serious consequences of their gluten reaction. They may suffer severe depression leaving them sad and moody a lot of the time. They may also suffer from bowel conditions. In some cases a severe gluten intolerance can leave the sufferers at risk of contracting cancer of the bowels, if it is left undetected. What Are The Minor Symptoms? There are also many minor symptoms associated with gluten intolerance. These symptoms affect the majority of gluten allergy sufferers. They can be annoying and uncomfortable but are not life threatening and are usually manageable. One of the main symptoms of gluten intolerance is bowel discomfort. 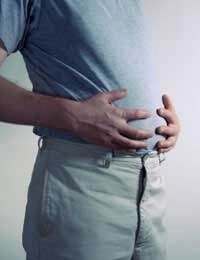 The sufferer may feel bloated and uncomfortable after consuming food products that contain gluten. They may experience constipation or diarrhoea. In some cases the sufferer may develop Crohns Disease. Headaches and nausea are also common symptoms of a gluten allergy. The sufferer may find when they eat gluten products they feel ill for some time after and may have painful headaches. The sufferer may also experience cramps and pains in the stomachs and bowel areas. One very common problem of gluten intolerance is malabsorption. This means the sufferer is unable to absorb all the nutrients he or she needs from the foods he or she eats. This can lead to weight loss and fatigue. In children especially if they are not receiving all the nutrients they require then they could suffer from weight loss and stunted growth. This is both a minor and a major problem. The sufferer may suffer a minor lack of nutrients which can be corrected through pills. The deficiency may not cause too many problems. A major deficiency of nutrients though can lead to anaemia - an iron deficiency. Another common minor side effect of gluten allergies is mouth ulcers. The sufferer may suffer from mouth ulcers immediately after consuming gluten or prolonged consumption of gluten could mean they are more susceptible to mouth ulcers. Itchy skin and some skin conditions can also be associated with a gluten allergy. When the sufferer consumes gluten he or she may come out in a rash or suffer from dry flaky skin as a result of prolonged gluten consumption. This can be treated with creams but will continue to appear until gluten is removed from the diet. Minor symptoms of gluten allergies can be managed with a controlled diet and should not have any long-term effects on the sufferer. If you think you are suffering from a gluten allergy then it is important to speak to your doctor and request a test. Once you know you have the disease you will know what lifestyle changes to make in order to cope with it. Speak to your doctor today if you have any concerns. I also forgot going through cycles of constipation and diarrhea also. I can be constipated for 4 days and then have 2-4 days of diarrhea.Help!! I was diagnosed with IBS at the age of 23. I am now 43 and over the years have had bad flare ups and the rest of the time just going through cycles of stomach pains, bloated abdomen, headaches, arm muscle aches, nausea with or without headache, extreme mood swings, itchy skin, sometimes either not sleeping or exhausted and in bed at 9pm!I go to the doctor and either am prescribed buscopan, colpermin or on the 10/5/11 this year due to the worst bout I have ever had prescribed Fybogel Mebeverine and finally yesterday the symptoms eased. I just went into the chemist and asked if I should continue the medication since after 10 days I feel better. He said yes and went on to discuss my symptoms in depth. He then said it sounds to me either you could be intolerant to dairy products or wheat and possibly need a gluten free diet? Need some advice please.